Carbonara Inspired Shrimp Alfredo is a restaurant-quality shrimp recipe made right at home in less than 10 minutes. 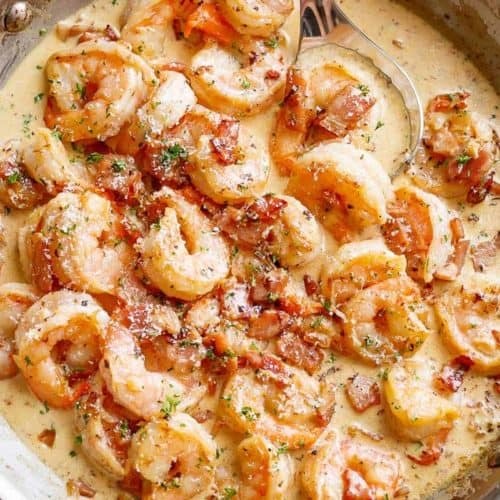 Crispy bacon and juicy shrimp in a delectable parmesan cream sauce! It doesn’t get any easier than this LOW CARB AND KETO APPROVED Shrimp Alfredo. 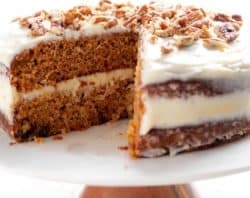 A delicious family favourite that is easy to make, tastes absolutely amazing and cooked in one pan. A creamy Shrimp Alfredo with zero pasta and zero guilt, perfect for a low carb recipe idea. Shrimp cooked in an egg-free carbonara inspired sauce with crispy bacon pieces — a super quick and easy dinner that even kids love. Great for those with egg allergies craving carbonara, or for carbonara lovers! 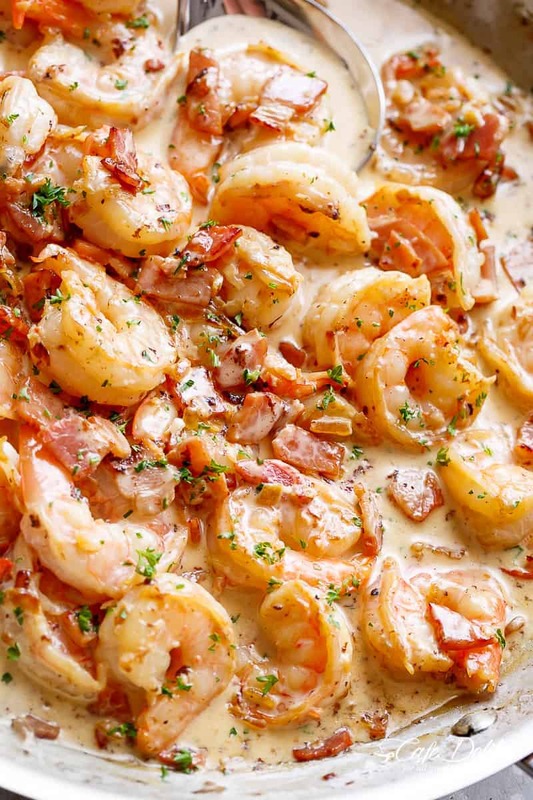 HOW DO YOU MAKE CARBONARA SHRIMP ALFREDO? Bacon pieces are fried first until crispy. 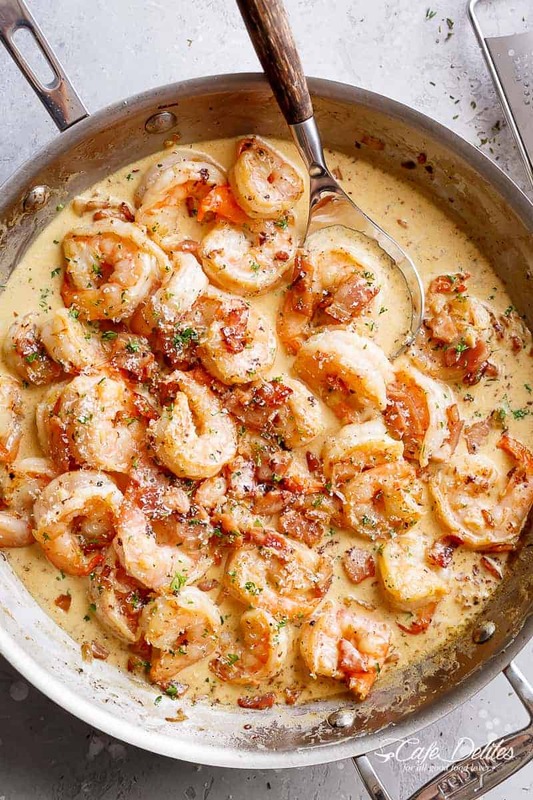 Keep some bacon fat in the pan to fry onion and garlic, then add shrimp and let cook for 1 minute. Use jumbo shrimp or prawns for this shrimp Alfredo recipe. You can use shrimp with tails left on or removed — it’s completely your choice. Pour in heavy cream, half and half or evaporated milk for your cream base. Taste test the sauce and adjust salt and pepper, if needed. If your bacon is very salty, you will not need to add salt, just pepper. 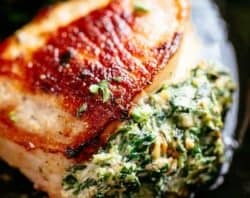 Once the sauce has thickened, add in parsley or any other herb you prefer, and you have the perfect dinner for any night of the week! I recommend using uncooked shrimp for this Alfredo recipe. 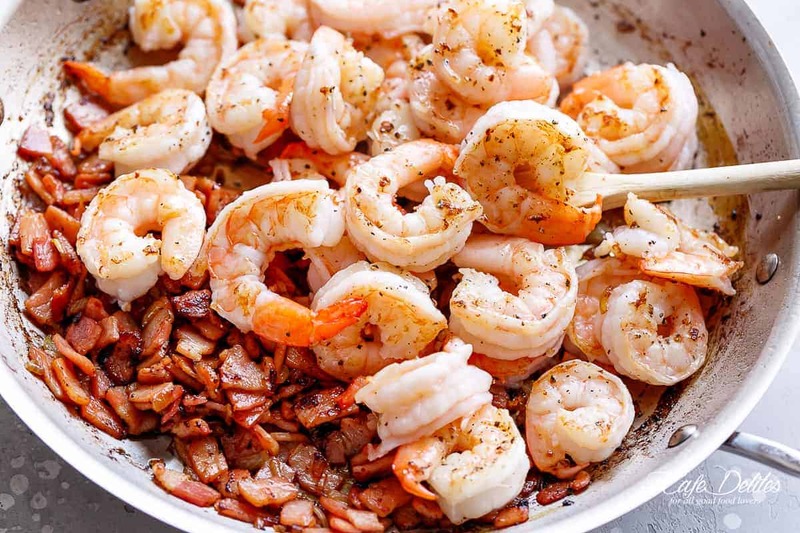 Keep in mind that shrimp cook FAST, so its best to have all of your ingredients ready on your kitchen bench or near your cooking area while cooking. That way you can easily throw your ingredient in the pan as you need them. Shrimp change colour to pink and opaque when they’re done, which is a great indicator for you. Normally they only need 3-4 minutes to cook. Be sure to watch that they don’t overcook, or they may become tough and chewy. All up, our shrimp Alfredo is done is less than 10 minutes. 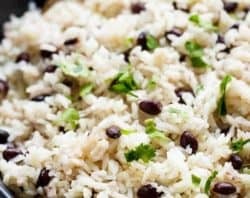 Feel free to toss in zucchini noodles or cauliflower rice for a low carb option. Love carbs? Toss in your favourite pasta of choice! Fettuccine, spaghetti, linguine or penne pasta work well, as does plain rice. Carbonara Inspired Shrimp Alfredo is a restaurant-quality shrimp recipe made right at home in less than 10 minutes. 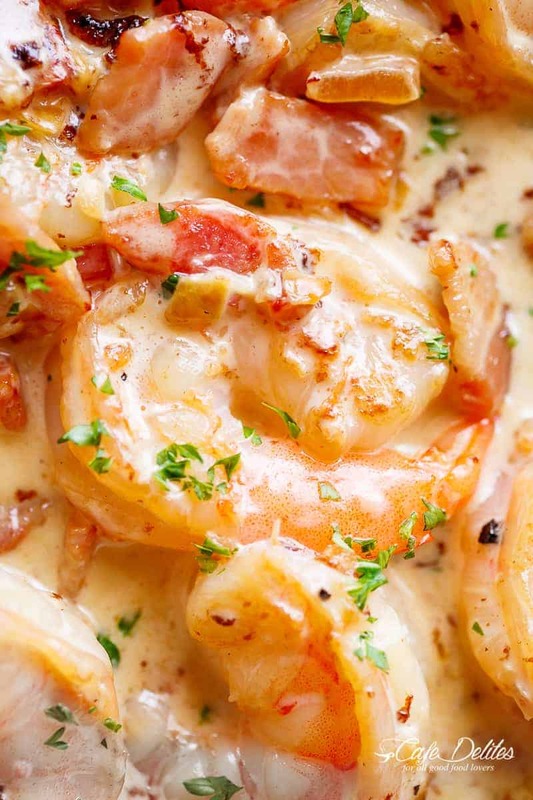 Crispy bacon, juicy shrimp in a delectable creamy sauce! It doesn't get any easier! Heat oil a large skillet over medium-high heat. Fry the bacon until crispy. Drain off some excess fat, keeping about 1 teaspoons worth in the pan. Add the onion and garlic and fry until onion is transparent (about 1 minute). Reduce heat to low. Add shrimp and let cook for 1 minute, while stirring occasionally. Pour in half and half (or cream) and add in parmesan cheese. Bring the sauce to a gentle simmer for 1 minute. Season with a little salt and pepper to your taste and let cook until the parmesan cheese has melted, the shrimp are cooked through and the sauce has thickened slightly. Top with parsley, taste test sauce and adjust salt and pepper, if needed. Serve over pasta, rice, steamed veg, mashed potatoes, cauliflower rice or zucchini noodles. Tried many of the recipes before, but the Carbonara Shrimp Alfredo perhaps, turned out the best. I was going to use raw frozen shrimp from grocery store, but happened to be in Sam’s Club and bought a whole pound of large shrimp for only about S10…..more than enough for 3 people. shelf basil AFTER being plated. Will try again in near future. 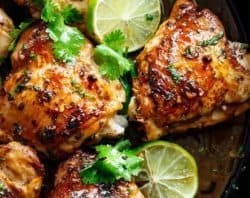 Hi Karen, You’ve just inspired me for our dinner tonight since we’re feeling the heat here in Aust. at the moment at 41C. (105.8F). 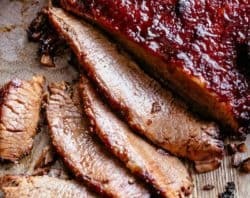 Since this is a very quick meal to put together it’s just the thing to make and not heat up the kitchen, I’ll be serving a lovely tossed salad on the side. An extra for myself to keep cool, I’ll be drinking a “Lemon, Lime and Bitters” on the rocks. How much cooler can one get as I’ll be serving dinner tonight for hubby and I – both of us sitting in the pool. Aaaaah! now that’s what I call COOL! Yum! This looks so good. 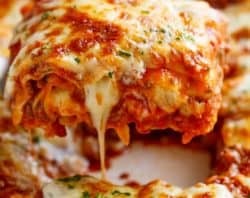 Would be a great dish for Valentine’s Day! 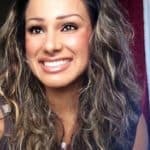 I just wanted to compliment you on your excellent site and your incredible recipes. I have traveled the world for many, many years. I got so spoiled from eating great food, that when I would get back stateside, I couldn’t find food of that quality here except a few places in Atlanta. So I became a Gourmet Cook so I could have great food when I got home. Ever since I found your site, I haven’t been happier. I know you have to work very hard to do what you do, and your photos are just another example of your expertise and professionalism. Thank you so very much! As far as I am concerned, you have the best site on the internet! WELL DONE!